Today saw a bountiful harvest of trailers dropping onto YouTube like so many overripe fruits, with delights including a new documentary on the living saint that was Fred Rogers, another on a real-life exorcist from The Exorcist director William Friedkin, a clue to the whereabouts of Hawkeye (he’s been busy playing an adult game of Tag), and a new trailer for Sicario followup Soldado. Pour yourself a refreshing beverage, put in your headphones, and enjoy these bite-sized looks at upcoming films in a little experiment we’re calling Trailer Happy Hour. 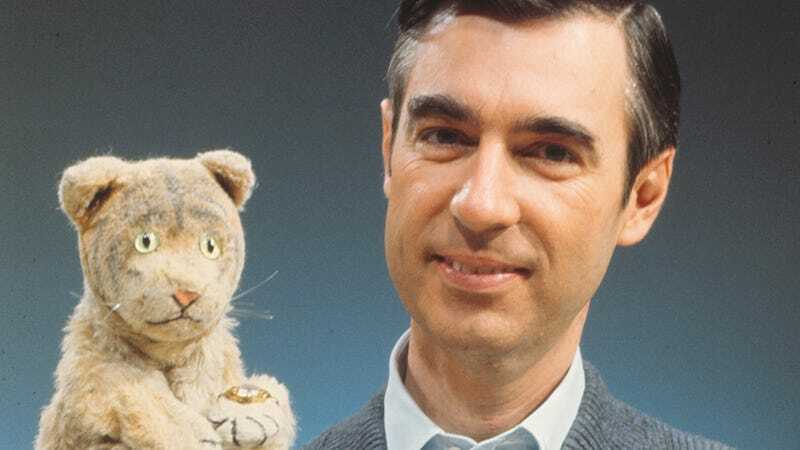 After its screening at SXSW, this morning Focus Features debuted the first trailer for its Fred Rogers documentary Won’t You Be My Neighbor? on what would have been Rogers’ 90th birthday. This one’s set to debut in theaters on June 8. Also debuting today is the trailer for William Friedkin’s The Devil And Father Amorth. Not content to simply shape our collective cinematic nightmares with The Exorcist, this documentary sees Friedkin shadowing Father Gabriele Amorth, official exorcist of the Diocese of Rome, as he goes about his supernatural business, including a demonic “house call.” Based on the trailer, it looks like Friedkin is going for a more Michael Moore/Morgan Spurlock approach to documentary, centering himself as a character in the film. The Devil And Father Amorth is due out on April 20. Never say that Jeremy Renner isn’t devoted to his fans. Renner (we’re assuming) skipped the Avengers: Infinity War trailer shoot to introduce the trailer for his upcoming movie Tag, the newest in the “what if innocuous activity, but violent and with swears?” subgenre of contemporary ensemble comedies based on a 2013 Wall Street Journal story. Ed Helms, Jake Johnson, Hannibal Buress, Jon Hamm, Rashida Jones, Isla Fisher, Annabelle Wallis, and Leslie Bibb co-star in the film, due out June 15. Finally, we’ve got a new trailer for Sicario: Day Of The Soldado, filling in just a little bit of backstory for Benicio del Toro and Josh Brolin’s ruthless assassin characters introduced in the first Soldado trailer back in December. Italian TV director Stefano Sollima takes over for Denis Villeneuve for this sequel, due out June 29.